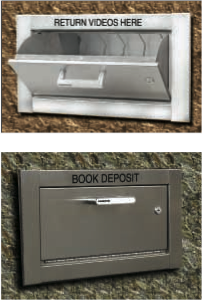 Hamilton 145DB Retail Depository w/ Built-in Theft Protection - Now ADA Compliant. Provides security with an anti-tampering design and low maintenance Stainless-steel face & drop chute. ADA Compliant ? Provides high security with an anti-tampering design ? Low maintenance Stainless-steel face & drop chute ? Can be customized with any faceplate message ? Access can be limited with a key lock feature A Time Saver for our customers... a nightmare for thieves. 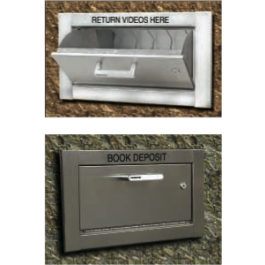 Providing a convenient place for patrons and customers to drop off books, tapes or small packages is great for business, but many drop off slots make it easy for thieves to ?fish? products back out through the slot. The After Hours Drop Box, from Hamilton Safe makes it almost impossible. Hamilton has been frustrating thieves and bank robbers for nearly a half century, so they know ow to make life difficult for anyone interested in making an illegal withdrawal from your business. Architects and buyers, please contact us for written architectural and engineering specifications or for custom design details.